The German Police have raided several properties throughout Germany in connection with an ongoing investigation related to a radical group which is said to be associated with the K.K.K. (Ku Klux Klan). The police are looking at 17 suspects. 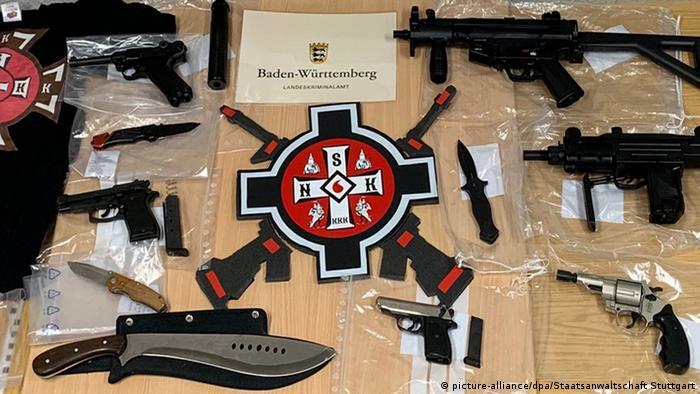 12 apartments have been raided in 8 different parts of Germany namely, Baden-Württemberg, Bremen, Hamburg, Lower Saxony, North Rhine-Westphalia, Rhineland Palatinate, Saxony Anhalt and Thuringia. These apartments belong to the suspected members of an extreme right group called the National Socialist Knights, of the Ku Klux Klan, Deutschland. The German police entrusted 200 officers for the 12 raids. During the raids, the police found and seized more than 100 weapons, which included air-guns, swords, machetes, and knives. There is no official confirmation about any arrests. 40 persons are under investigation. Out of these, 17 were targeted. These persons are aged between 17 and 59. The members of this group have a right-wing orientation and support National Socialism. Investigators found out about this group when the found relevant chats in the chat history on a mobile phone during another investigation. This mobile phone had seized as a part of investigations into the use of insignia of illegal organizations. The investigators have so far found no evidence linking the extremist group with other KKK organizations. The group is believed to recruit members online and charged monthly fees. The KKK is well known in the United States as a hate group. The KKK began in the southern United States in the 1860s. They have since used terrorism–both physical assault and murder-against groups or individuals whom they opposed. Ever since then there have been three prominent waves of the KKK, the second in 1915 and the third and the current manifestation in 1950. The Anti-Defamation League and the Southern Poverty Law Center have different estimates as to the number of members in the KKK. The ADL estimates around 3000 members while the SPLC estimates it to be around 6000. Although members of the KKK swear to uphold Christian morality, virtually every Christian denomination has officially denounced the KKK. There is now published research about activities by similarly named groups in Germany. Read more here. Despite the fact that the groups leave traces of online exchanges, financial transactions, offline and online communication with other radical groups, ammunition and gear purchases, insignia and graffiti, etc. Despite this fact, our investigative agencies may be compelled to spend money, time and effort to bring these to book. In times of modern technology, intelligence gathering also needs a messiah which can make it more efficient, reliable and cost-effective. The case of the German radical group which associates itself with the dangerous KKK falls under the ambit of Counter-terrorism. The savior mentioned above is a revolutionary technology called iCognative developed and provided by Brainwave Science. It quickly detects hidden information in the brain of a suspect by directly measuring his or her brain wave response to crime-specific information. This crime-specific information is gathered by investigators during the investigation. This information comprises images, words, and phrases related to the crime. A witness is expected to know such crime-related details because they have seen the crime take place. At the same time, a suspect is supposed to be aware of an overlapping set of information as they have planned and /or executed the crime. In this case the stimuli which is to be presented to the suspects, after their arrest and during the iCognative test are pictorial/verbal details related to the online recruitment process of the group, the monthly fees transactions, the recruits that they interacted with, their internal communications, assaults/deaths which are likely to have been committed by the group, their insignia, the various weapons which have been recovered from the raids, etc. When the suspects are shown the above stimuli during a iCognative test, their brains will respond differently depending on whether this information is already present in their brains or not. The brain responses are picked up using a specialized headset which the subject of the test wears. After each stimulus is flashed on the screen, the headset records and conveys the measurement to the iCognative computer system. After a 45-minute test, the system results in either of the two outputs namely ‘information absent’ or ‘information present’. There is not one but many benefits of the iCognative system. It is highly accurate, and thus extremely consistent and reliable. There is no waiting time for the report, rather the reports are produced as soon as the test ends; because the computation is carried out by the highly advanced and powerful iCognative system. The impact of iCognative is felt far and wide as it is applicable to 85% -90% of the cases. In comparison, a DNA or a conventional fingerprinting test is not only very costly and time-consuming but is merely applicable to 1-2% of all cases. The icing on the cake remains, that there is no torture involved during a iCognative test. It has no workarounds, it reports no false positives or false negatives. It can be conducted in any language, as the system is highly customizable in functionality as well as the language of use. What’s more? There is no need for a costly lab to compute results, iCognative needs a trained administrator, a computer system and a headset. Not only does it help to identify the guilty or exonerate the innocent, but it helps in deciphering the structure of the criminal organization, if any, of the test subject, thus helping break down complex terrorist organizations by highlighting the kingpins. Even an inactive radical can be identified because his or her brain cannot simply forget the propaganda and radical sentiments. The German police and Counter-terrorism agencies will be able to save time, money, effort and gather much more information by simply using iCognative upon the arrest of the suspects. This will go a long way in removing radicalism and extreme-right wing activism from Germany.